Kim Webby built his first harp at home as a schoolboy for his sister Helen, principal harp with Christchurch Symphony since 2000. Brother and sister have forged separate but complimentary careers in the world of the harp. 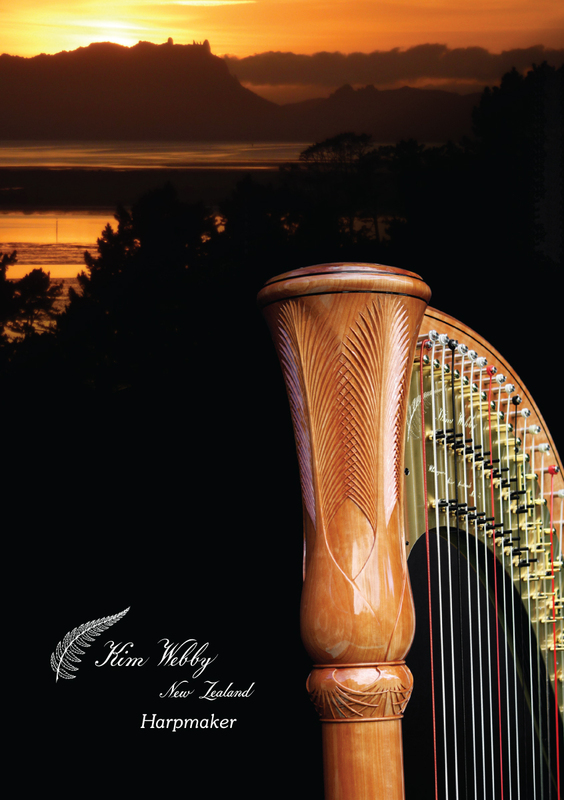 Kim has spent more than 35 years making, servicing and repairing a wide range of harps in New Zealand and overseas. This diversity of experience has led to the evolution of Kim’s highly successful concert and lever harps. 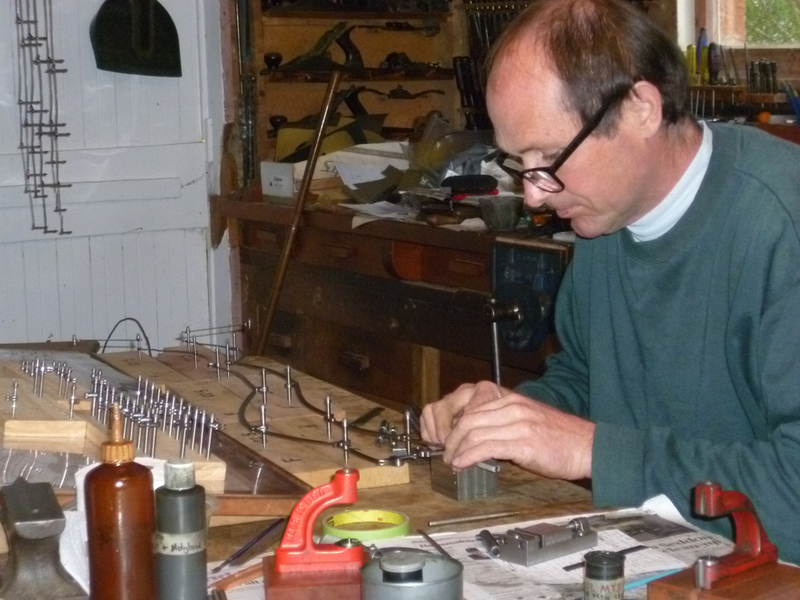 He crafts his instruments in a small workshop in northern New Zealand. Welcome to the Kim Webby family of harps. “You are playing a unique work of art. It’s something that is priceless”. He was completely right. A Kim Webby harp is an instrument like no other; beautiful, exquisitely crafted, a dream to play, with an individual and stunning sound. Every day it is a privilege to play. It has made such a difference to my life. 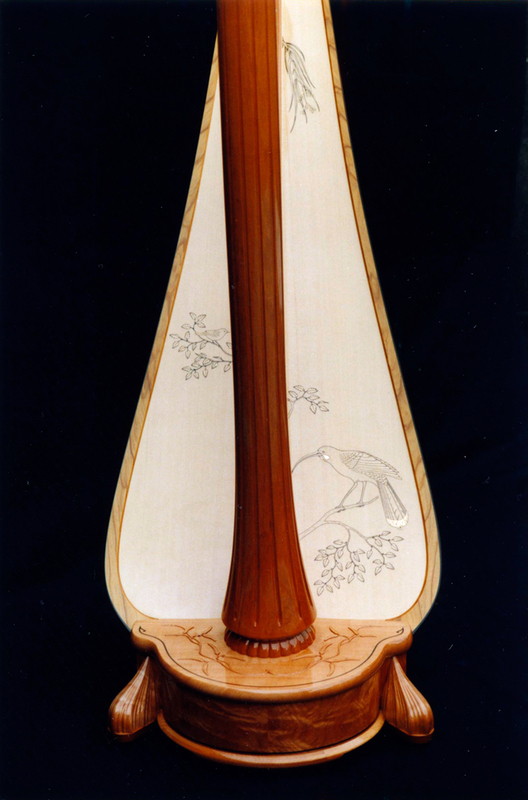 This harp is named Te Huia, after the beautiful New Zealand bird. 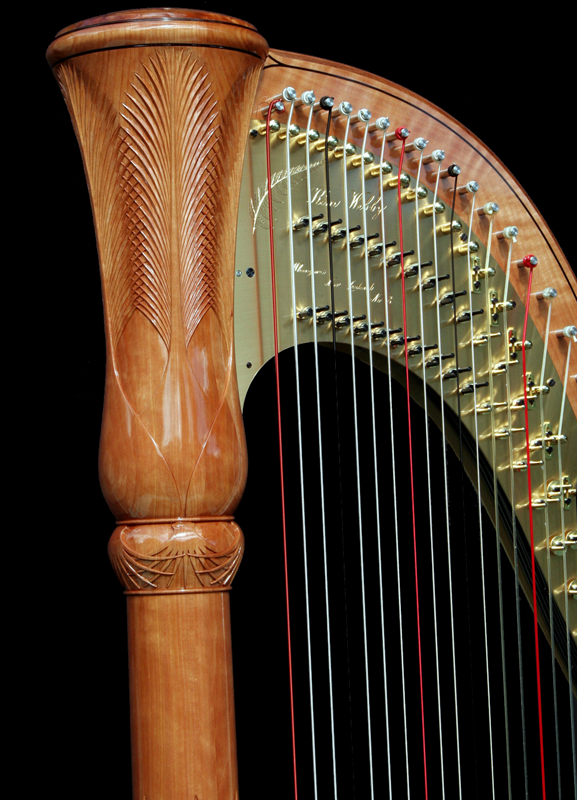 The harp is unique because it is the complete work of one master craftsman. Distinctively South Pacific in character, the instrument is graced by a carved Nikau palm and native vine, complimented by delicate rosewood inlay, all inspired by the stunning beauty of New Zealand’s forest and flora. 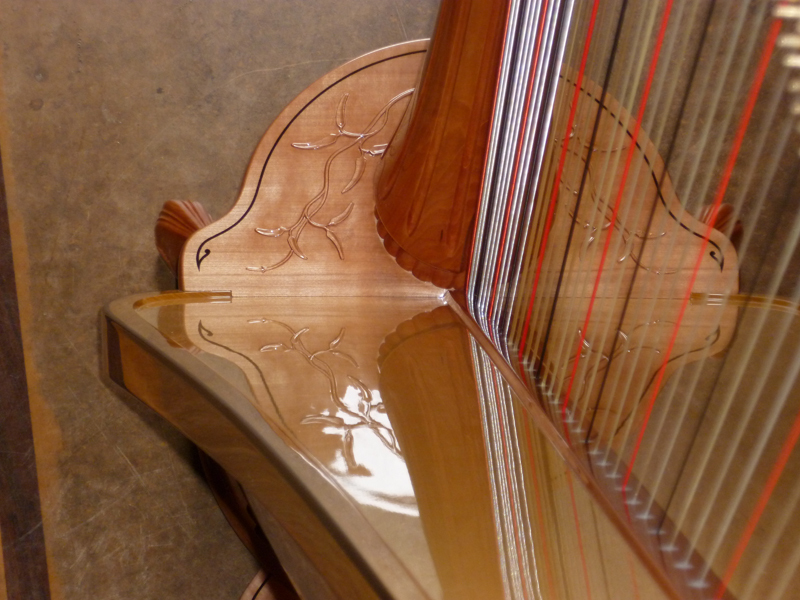 This crafted concert grand is the culmination of over 35 years’ experience and innovation in harp making. 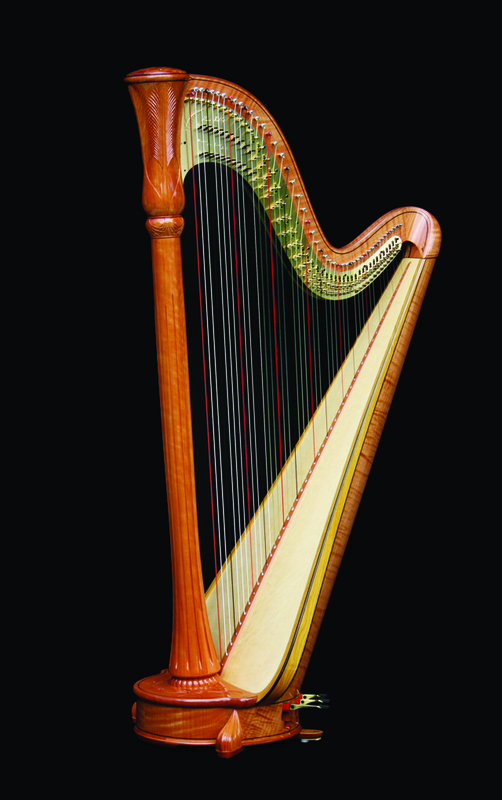 Kim Webby harps are admired worldwide for their reliability and their clarity and strength of sound. His harps have been shown to retain these qualities for many years. 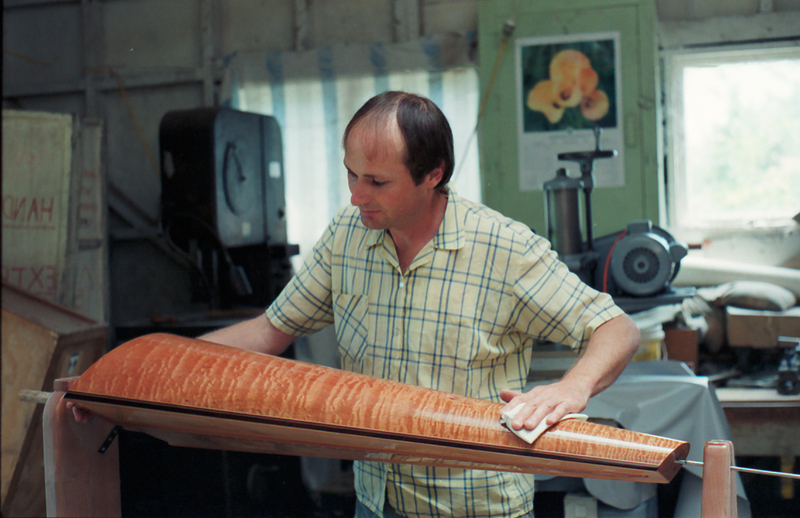 Every concert grand harp Kim Webby has crafted is in professional use, with two in major NZ orchestras. Their reliability has been proven through many years’ use with an orchestra constantly on tour both nationally and internationally. I have owned a Kim Webby harp for over twenty five years, and it has been the most reliable and the most consistently beautiful harp I have ever owned. I am as thrilled by the sound and responsiveness of this harp as I was when I first bought it. Kim’s harps produce a gorgeous clear tone, with a perfect balance of brightness, projection, and warmth. My orchestra, the New Zealand Symphony Orchestra, also owns a Kim Webby harp, which stands up to the rigours of touring extremely well, hardly even going out of tune after travelling. The mechanisms of these harps are so well designed and constructed that the player never has to worry about them, but instead can simply delight in the wonderful experience of playing such a beautiful instrument. 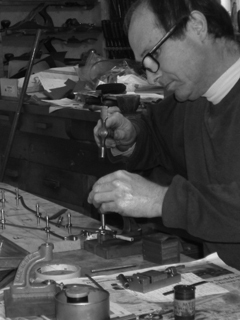 …is an artisan harp: one man’s vision from design, tooling and crafting through to the finished instrument. 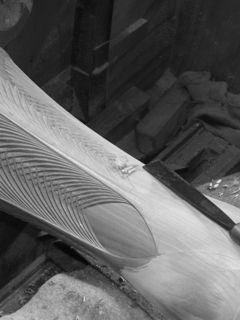 Te Huia is crafted by hand using manual machines and hand tools, with loving attention to both the beautiful exterior and the hidden inner workings of the harp. An enormous amount of time is taken on what is not seen. …features the natural elegance of New Zealand tawhairaunui/red beech, which naturally darkens to a warm red-brown. More recently, some trees have been chosen by Kim from sustainably managed forest then felled and chainsaw milled in the forest. The timber has been naturally air dried for a minimum of eight years, then preconditioned in a humidity controlled wood storage room. …has a crystal clear sound, balanced over the entire range. Careful choice of materials and design means that this clarity of sound is retained. Sound engineers love working with these harps! …has full-length strings with a compact design that is very comfortable to play. 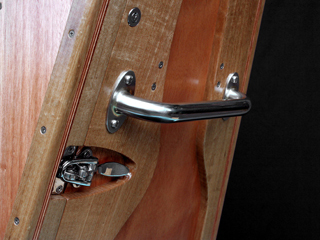 The action mechanism has been designed to give lots of room for the hand in the treble. … is completed with a durable two part finish that will stay looking new for years to come. 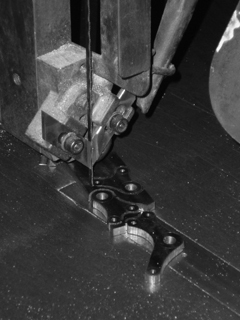 Special Kim Webby pedal rod couplings which eliminate rod breakage. 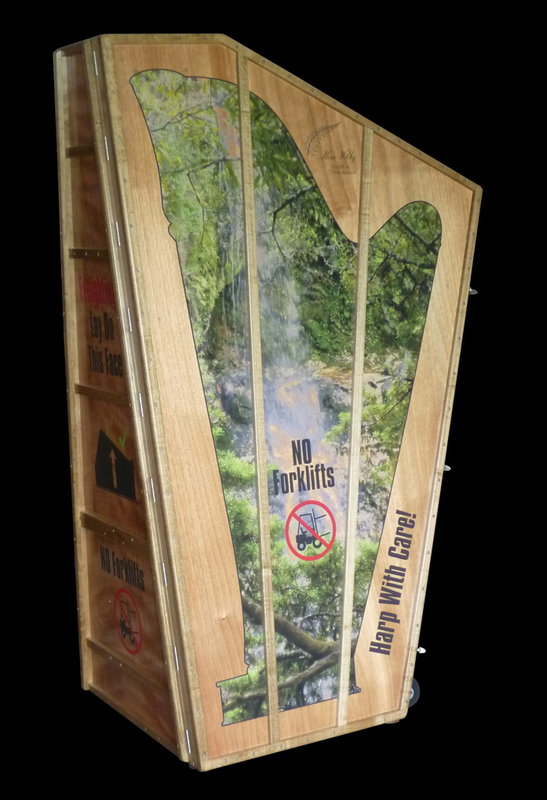 This was an innovation on his first 43 string pedal harp built in 1986/87 and was advertised with his second harp exhibited at the 1990 World Harp Congress. Other major makers now use this system. The robust mechanism is designed for smooth and quiet action, simplicity and reliability. It is built to last a professional lifetime. 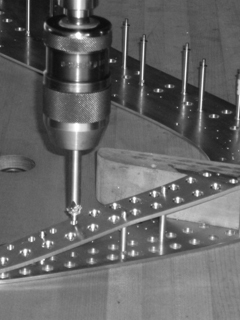 Large diameter disc pins for longer string life. 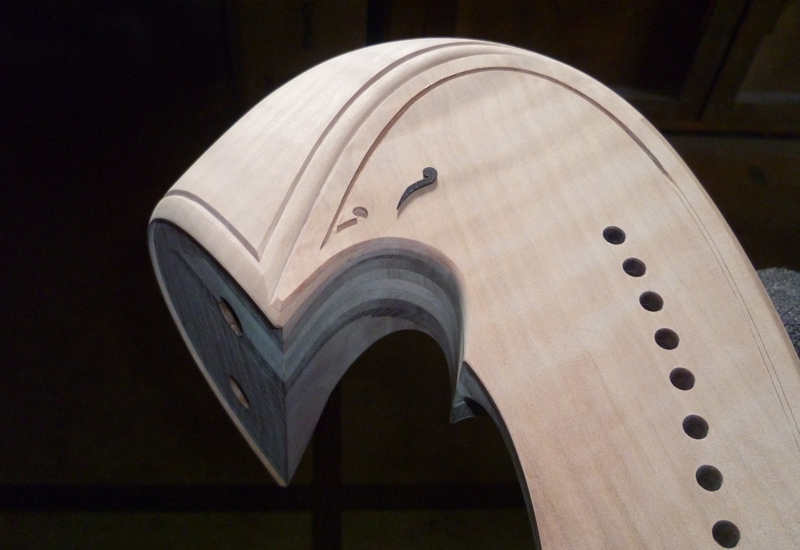 Adjustable rear feet to enable the balance of the harp to be matched to the player. Te Huia will receive on-going service. 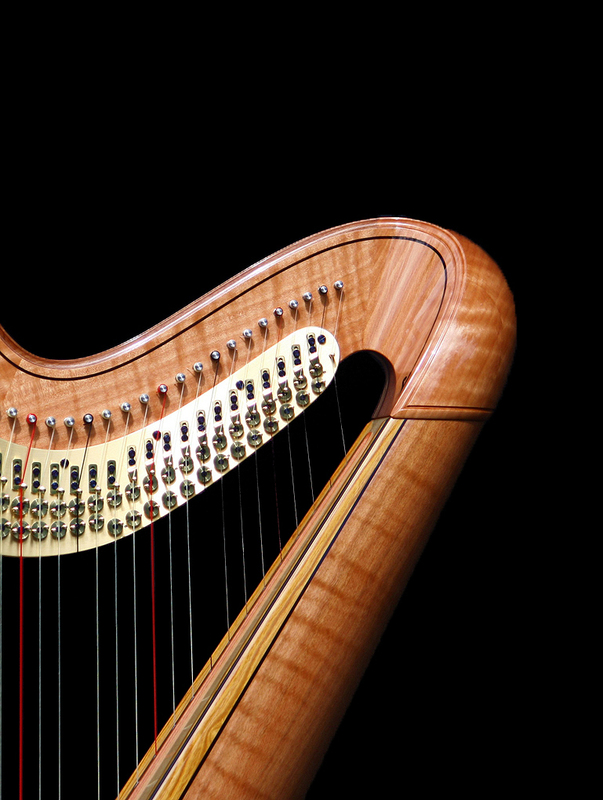 Kim aims to personally service each harp every 4-5 years, wherever it is in the world. Airfreight to your home/destination (but: please note transit insurance, taxes, duties and customs clearance charges payable at your border are not covered in the price of the harp and are your responsibility). Admin - ©Kim Webby Harp Maker - All Rights Reserved - Web Design TOTAL IDEA Co.